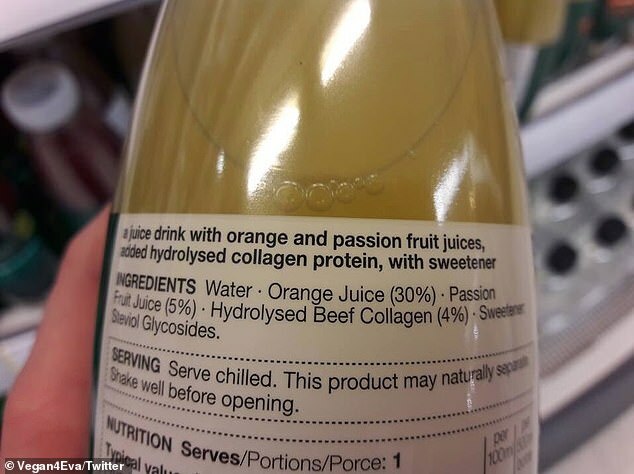 Marks and Spencer’s new Super Water Protein juice drinks, which come in ‘orange and passionfruit’ and ‘watermelon with a hint of lime’ flavours, are made up of four per cent hydrolysed beef collagen. One disgusted shopper, Richard Moir, admitted he isn’t a vegan but still wouldn’t drink ‘gravy infused fruit juice’. 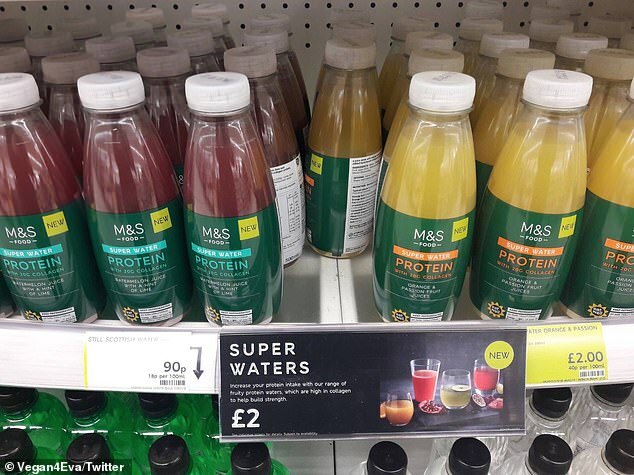 The Super Waters, which retail at £2 for 500ml, claim to ‘increase your protein intake’ and are ‘high in collagen to help build strength’. 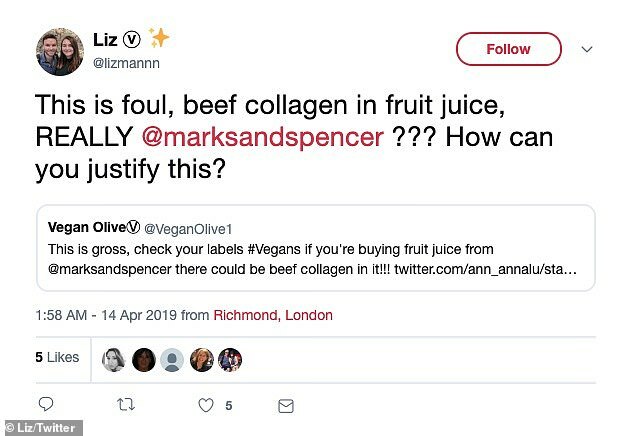 It was first brought to people’s attention by Twitter user @Vegan4Eva, who asked the retailer ‘why on earth’ there is beef collagen in the fruit juices. 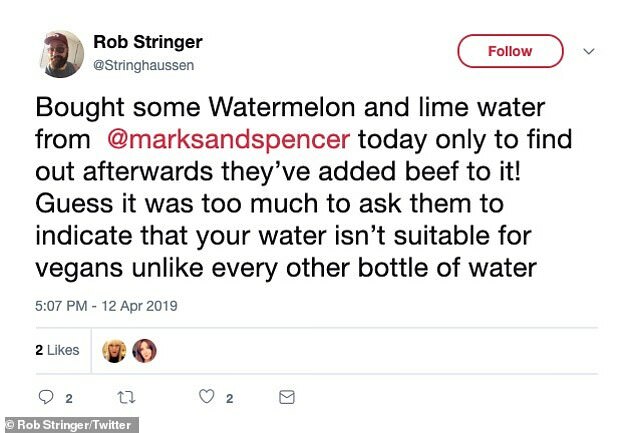 Rob Stringer also took to the social media site to complain, writing: ‘Bought some watermelon and lime water from @marksandspencer today only to find out afterwards they’ve added beef to it! There are two forms of bovine collagen used in popular powdered supplements – hydrolysed collagen and gelatin. Another tweeted: ‘Beef. Collagen. In. Fruit. Juice. Just think about that for a second,’ following by a series of vomitting emojis. 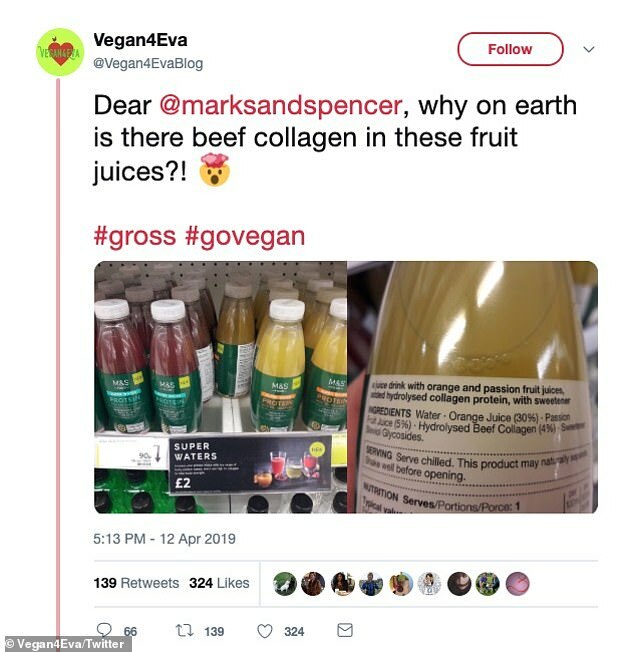 An M&S spokesperson told FEMAIL: ‘There’s growing demand for protein-based drinks that offer added vitamins and benefits. Last month we told how M&S shoppers were left baffled and amused by a pair of chocolate Easter bunnies striking a rather ‘suggestive’ pose. With its backside stuck up high into the air flaunting its milk chocolate tail, the ‘yoga bunny’ could conjure up a completely different scenario in your mind.